Dallas, March 24, 2015 - Dallas City FC announced today that the Dallas Convention and Visitors Bureau (Dallas CVB) has become the soccer club's signature sponsor. The partnership puts the City of Dallas name and slogan "DALLAS, BIG THINGS HAPPEN HERE" on the back of every Dallas City FC jersey and training gear. The Dallas CVB will have presence throughout the Dallas-Fort Worth areas, as well as in team media and promotional initiatives. The sponsorship also places the Dallas CVB logo on Dallas City FC Academy and Youth jerseys. Dallas City FC President Nicolas Ayala stated, "This partnership has special meaning to me because Dallas is the City that shaped my life and gave me the opportunity to grow as a person and a businessman. At Dallas City FC, we are extremely grateful to the Dallas CVB, the Dallas Sports Commission and the City of Dallas as they continue to give us the opportunity for continued self-growth and career fulfillment." In the past months Dallas City FC has had extraordinary growth at local, national, and international levels, positioning the club for continued success on and off the field for years to come. The club continues to grow its academy system and its international relations abroad in the soccer world. "We look forward to the relationship between the Dallas CVB and Dallas City FC," said Monica Paul, Executive Director of the Dallas Sports Commission. 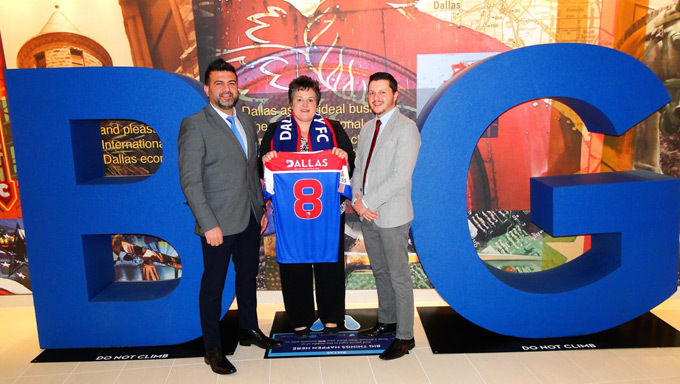 "This is an opportunity for the Dallas CVB to garner both international and local exposure while partnering with a local up-and-coming soccer organization." "To us this partnership made a lot of sense because we carry the name of the City in our very team name, in our club ownership and management we are a multicultural and international group of people that came together for a common cause. Thanks to our international background this partnership transcends the United States frontiers and the name of the City of Dallas will resonate in other countries and cities around the world," Jacob Tuygun, CEO of Dallas City FC and holder of FIFA credentials added.